Trasnagh, an Islands One-Design yawl has been nominated as a finalist in the prestigious Classic Boat awards 2014. Up for honours in the category "Best restoration under 40ft", this beautiful Alfred Mylne design was originally built in 1913 by Hilditch of Carrickfergus. Owner Ian Terblanche found her as a bare hull and has restored her with the help of boatbuilders Peter Nash and Brian Pomeroy and broker Peter Gregson. The yacht restoration was carried out in painstaking detail to deliver the highets levels of originality and authenticity. 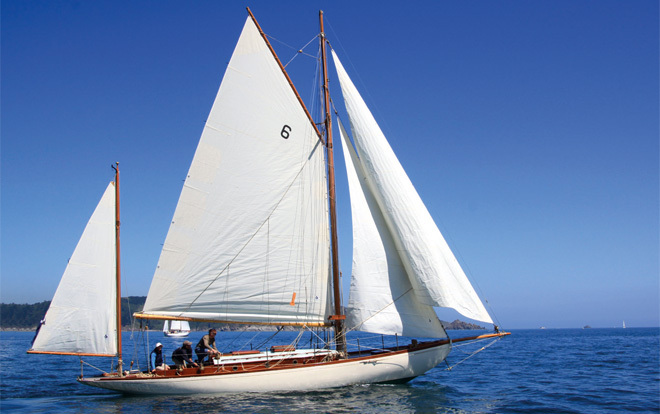 Teak decks were laid after Ian saw a photo of her winning the King George cup in 1927, and she was transformed from a bermudan yawl back to a gaff yawl with the help of Lee Rogers Rigging. Incredible that this boat is now over 100 years old - congratulations from all at Mylne to the owner and his team of restorers. We'd also encourage you all to register your votes for Trasnagh before midnight on the 16 February (anywhere in the world).